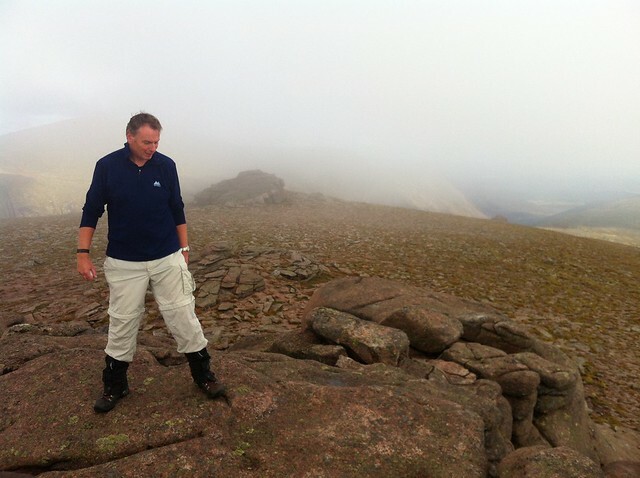 This report is inspired by https://www.walkhighlands.co.uk/Forum/viewtopic.php?f=9&t=66749 Another Cairngorm Round of Six, by Alteknacker. Many thanks for the inspiration. 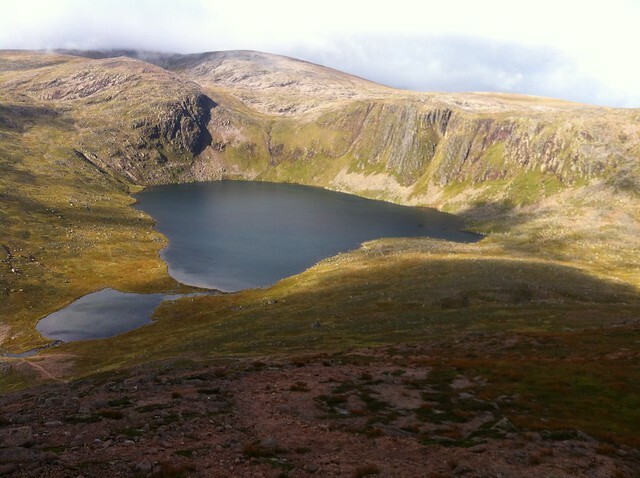 Although this route takes in six Munros, if taken over two days, it would be easy to add Ben Macdui. My buddy and I completed The Fisherfield Six earlier this year by camping halfway round the circuit. It gave us the wild camping bug. since then, I have been scouring the Munro book, looking for long walks in. 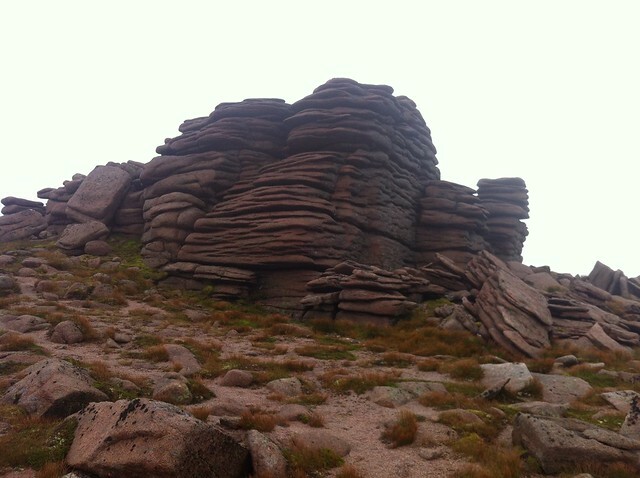 As I had a number of Linn o Dee side Cairngorms to bag, I was attracted by this report - but not the 14.5 hour day. I think it is important to acknowledge the wide range of age and fitness among the Munro fraternity. It's not always easy to plan a personal trip based upon the experience of a fellow blogger. If looking at this report for inspiration, we are 57 and 61, and go at a steady pace with a few, short breaks. We carried lightweight camping gear which amounted to a few pounds more than a daypack, but not so much you'd notice. As it turned out, our tents stayed in our rucksacks. We drove up from Edinburgh early evening and left Linn o Dee carpark just after 7pm. 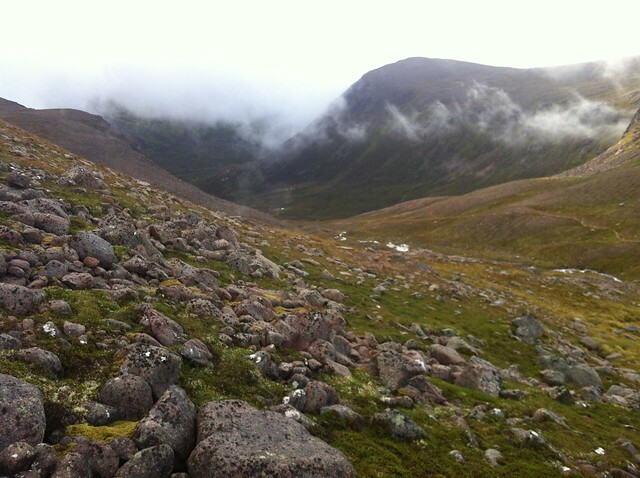 Within an hour we reached Bob Scott's Hut and spent the night with six others in the bothy. In discussion with fellow bothy dwellers, we decided our planned route was best tackled anti-clockwise - the opposite way to Alteknacker. This gave us one long day and one short one; with the intention of camping at Loch Etchachan. I had printed out Alteknacker's report and brought it with me. It made for interesting reading as we matched his exploits to our experiences. We tip-toed out of Bob Scott's early, and decided to have breakfast somewhere up Glen Derry. It's a very pleasant start to the route as the path up the glen follows the Derry Burn. After about 15 minutes, roughly level midpoint between Beinn Bhreac summit and Meall an Lundain, we came across a very rough path leading up to the ridge. I should stress this is very faint once you start on it, but once on the actual slope, it is there to guide you through the heather. We stopped and tried to take breakfast, but faced the only real problem of walking on a mild, summer's day - midges! Take note, throughout our two days, we encountered them en mass, even above 3000 feet. There was meant to be pieces of dried fruit in my instant porridge. I suspect I consumed added protein as well. Beinn Bhreac is dwarfed by its neighbours and the summit is only a little over an hour from Derry Lodge. 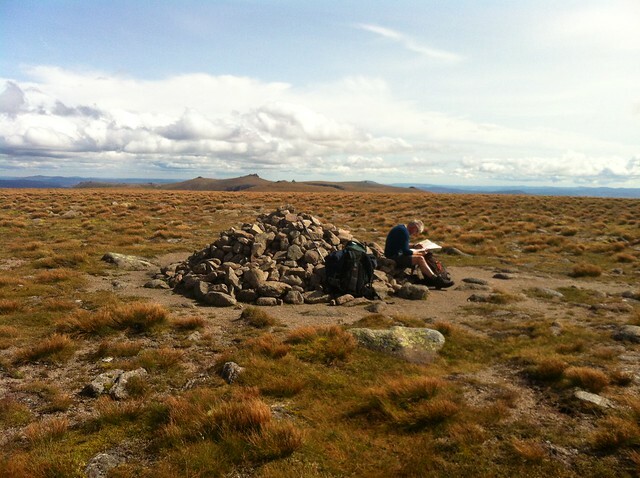 Alteknacker's report mentioned a big bog, between Beinn Bhreac, Beinn a Bhruid and Beinn a Chaorainn. The flat land between the three hills is indeed boggy, with lots of hags to circumnavigate. However, since we were walking on a clear, summer day, we didn't encounter too much difficulty. We kept right of centre, and got ourselves onto the lower slopes of Bhruid. I've encountered many a poor bog in my tome - this wasn't one of them. It may be a different case in rain and clag. 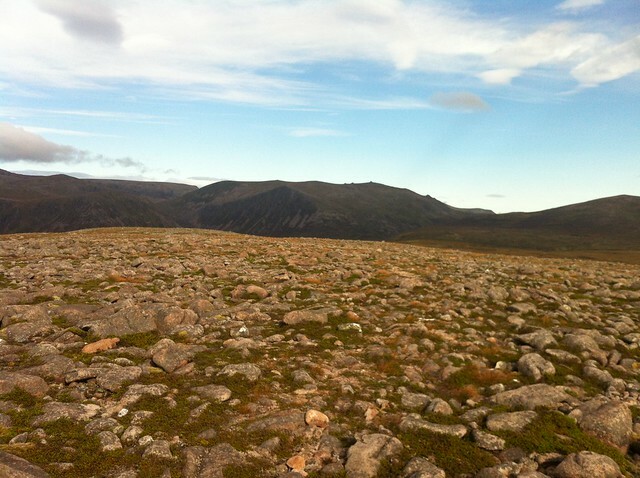 Derry Cairngorm, Beinn Mheadhoin and Beinn a Chaorainn on the slopes of Beinn a Bhruid. The bogland is in the foreground. Beinn a Bhruid is a huge, high plateau. It was prudent to call the North Top - eh..... North Top - so you know where to head. I imagine being up there in thick clag or a white out would create a different experience. 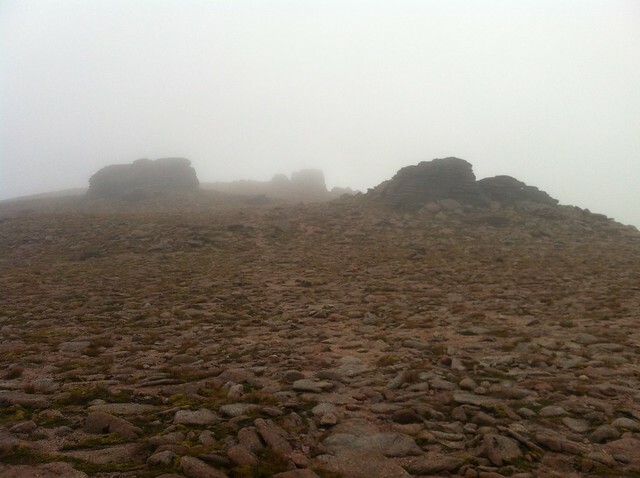 If anyone does go up there in poor visibility and fails to find the cairn, you won't have missed much. The cairn on North Top with Ben Avon in the background. The walk over to Ben Avon is a 2-3 hour round trip, depending on your fitness. Regardless, it's a fine walk with wonderful scenery. From the North Top plateau it looks a level stroll, but there is The Sneck to descend and climb both ways. However, it's path all the way and there is nothing strenuous. We left our rucksacks beneath a rock just past the summit and headed over to Avon. The summit of Ben Avon - tors are beautiful. 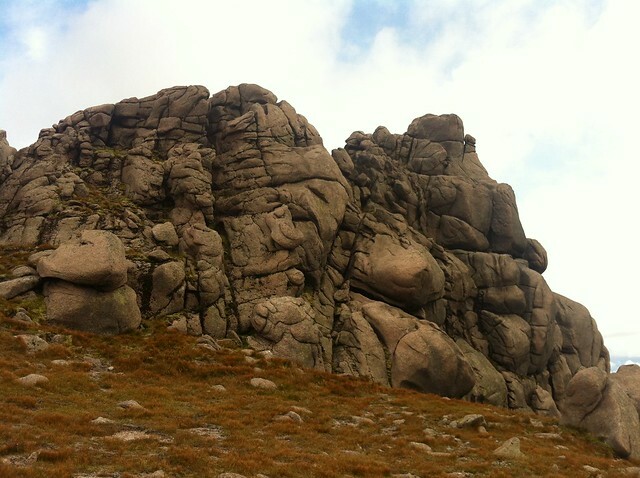 Some of the rock formations could pass for sculpture in The Tate Modern. 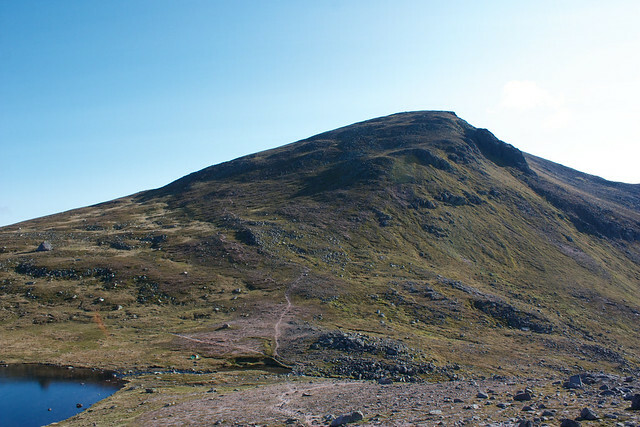 Technically, this route is seven Munros, since you have to retrace your steps back up Beinn a Bhruid. However, this is not that arduous. We made it back to our packs just in time. We had watched a shower coming towards us. No sooner had we got our jackets on, the heavens opened for over an hour. We headed down Bhruid, through some boulder field - where I managed to slip and crack my walking pole in two, then over the bog again towards Beinn a Chaorainn. Like Bhreac, this is a straight forward lump of hill, a bit insignificant looking next to the illustrious neighbours. It is from here, that I have to admire Alteknacker's appetite for adventure. 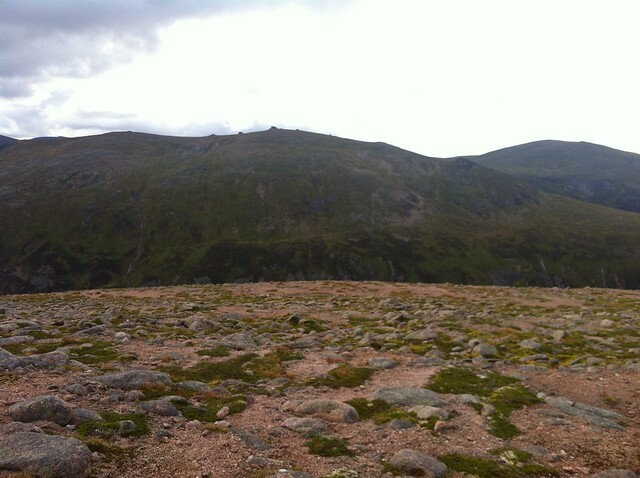 Chaorainn and Mheadhoin are the closest summits in proximity. 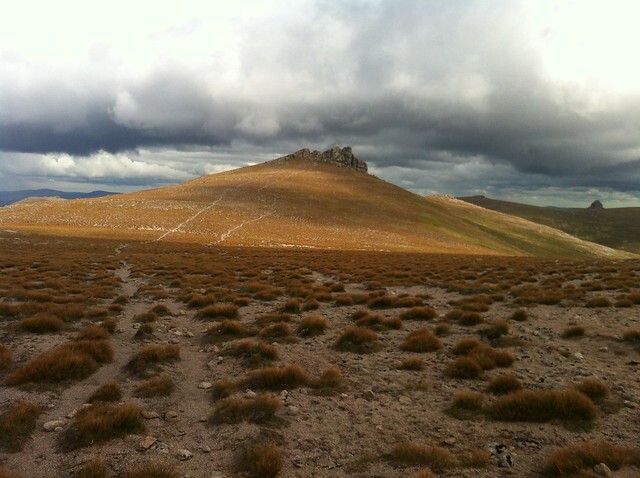 However, as you descend Chaorainn - I recommend the clear path from the summit, heading towards Glen Derry - you will notice the two hills face one another with exceptionally steep slopes. It's almost gorge like. I don't ant to put anyone off; if scrambling up and down steep, grass coated boulders is their thing; it just isn't mine anymore. The path down is still quite steep, towards the bottom, but nevertheless, straightforward. We now looked to head up towards Loch Etchachan to camp overnight. From Chaorainn, you start to follow the path back down Glen Derry, but can see the path heading up towards Etchachan on the right. I don't know how far you have to go down the glen to meet the junction, but we decided to cut down over a bit more bog, then found a small bridge over the burn. Ten minutes later, we arrived at Hutchison's Memorial Hut. OK, we had carried our camping gear all this way. 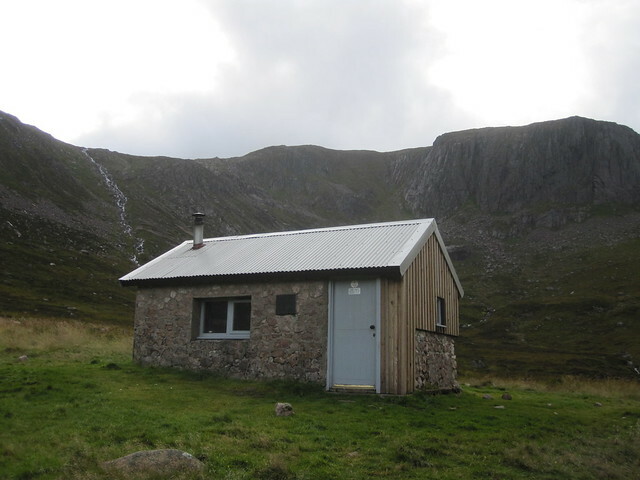 But the midge squadrons were patrolling in force, we had been walking 10 hours, and the hut looked too inviting inside. It was also deserted so we had a bed each. Easy decision! We cooked at leisure, blethered a while, then had an early night. 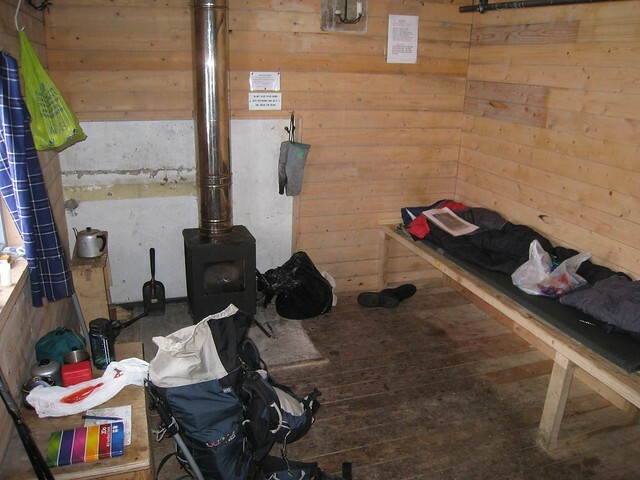 It felt particularly cosy half way through the night when we heard the rain pounding on the hut roof. We awoke to low but clearing cloud. It should be noted that the route from here on in - even if you choose to add Macdui to your route - is all straight forward pathways. They may not always appear on OS maps, but this area is almost as popular as The Lake District, and the routes between peaks are well established. The tranquility of Loch Etchachan at 8am. The path up to the Mheadhoin plateau. Approaching the Mheadhoin plateau in cloud. 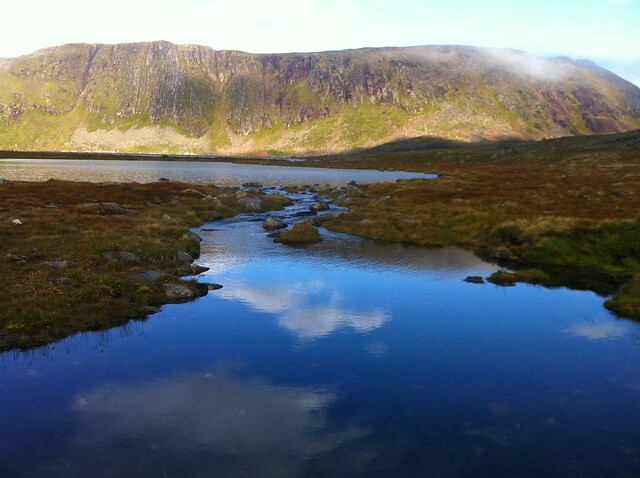 From Mheadhoin, you retrace your steps back to Loch Etchachan, whose east shore also serves as a bealach that connects Derry Cairngorm and Ben Macdui. The path is very clear and heads its way up towards Macdui. We had climbed it years ago, so once close to the ridge, we headed off left and found the path that connects Macdui and Derry. Heading down Mheadhoin towards Macdui and Derry. 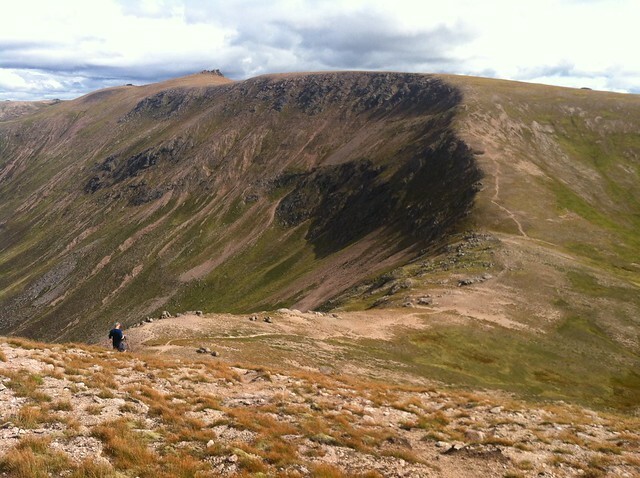 The path crosses over the entire Derry Cairngorm ridge. 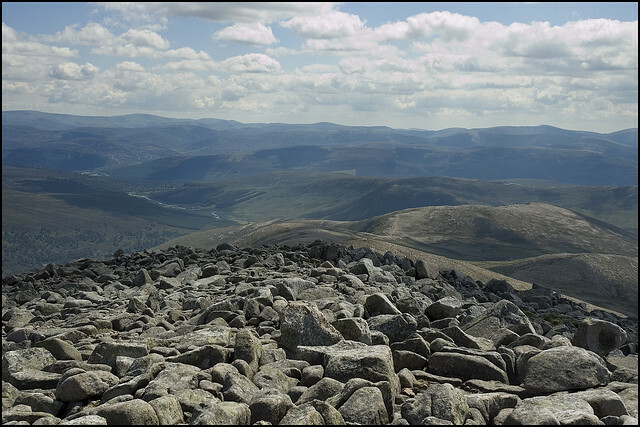 There are boulder fields either side of the summit which slows you down a bit. When you can't make out the path clearly through the boulders, it can easily be picked up again further on. 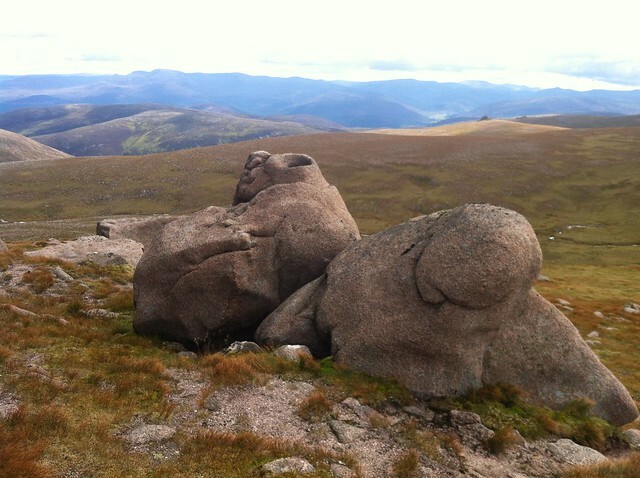 The Derry Cairngorm ridge. This photo looks worse than the reality. 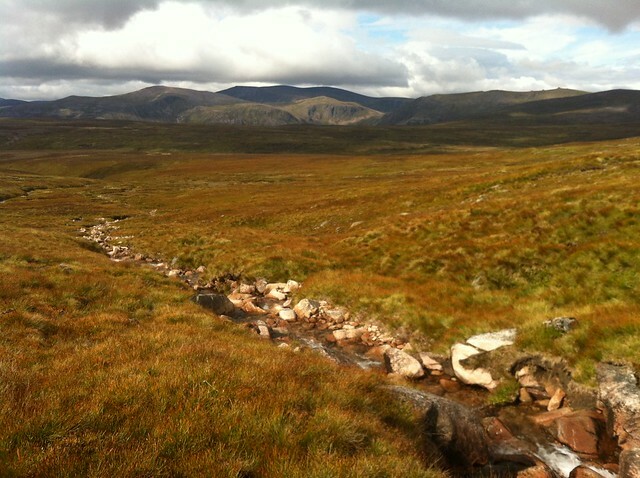 Once past the boulder fields, the path back to Derry Lodge is an absolute delight. The final descent to glen Lui includes beautiful stone steps. The total walking time for day two was less than five hours, so we were able to walk back to Linn o Dee and have late lunch in a Braemar cafe. If you added Macdui to this route, I reckon you would add less than a couple of hours. Wow, what a trek, well done! I love your pictures! 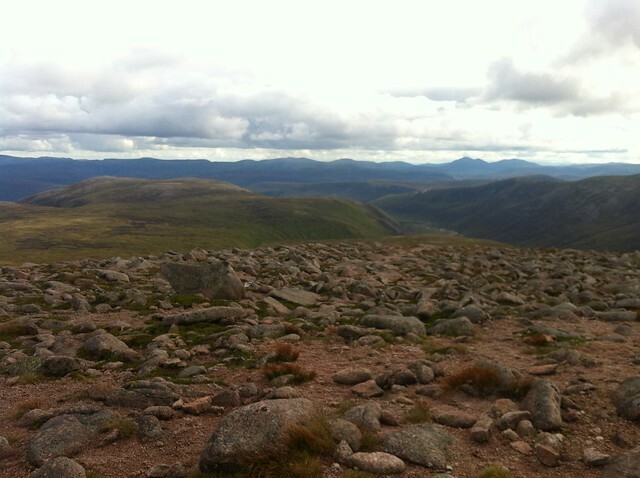 My camera was broken when I did Beinn a' Bhuird and Ben Avon, so it's great to see yours .